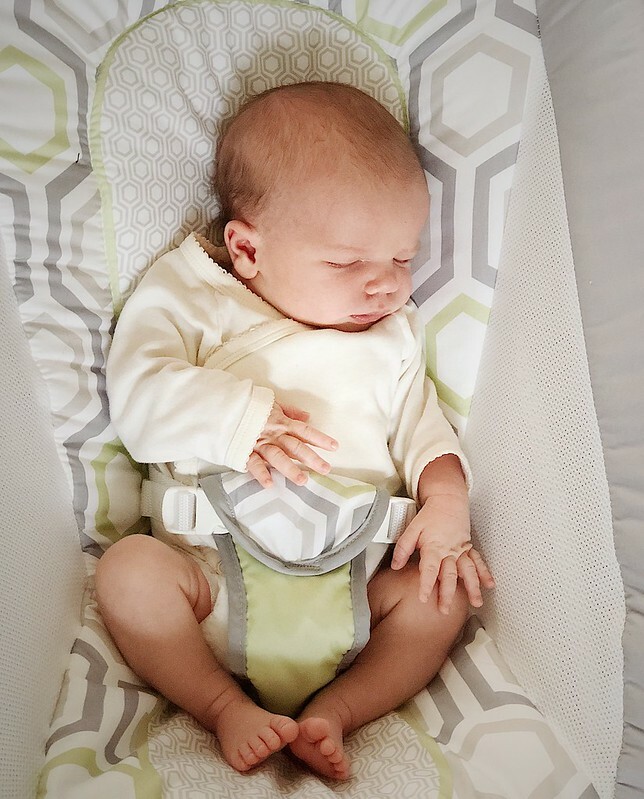 So it’s been over two weeks since Elliot was born (and actually three weeks since this birth story begins! ), but I think it’s time for me to share my story. As I’ve written about in the past, I prepared for my birthing time by doing the Hypnobabies home study course, so I wanted to make a note here that I don’t use Hypnobabies language throughout this story. If you’re currently taking a Hypnobabies class and are looking for stories, I’d highly recommend having a strong Bubble of Peace before diving into this one. It’s definitely a “change of plans” story. If you don’t know what any of that means, don’t worry about it. Anyway, I supposed my birth story starts at 9:15 a.m. on Wednesday, December 26th, when I had an appointment with an OB at my practice for a cervical check. 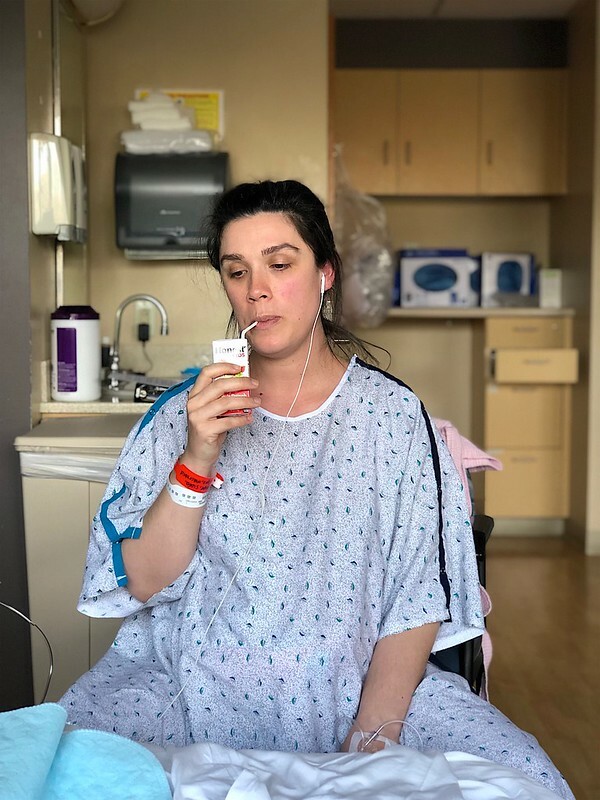 Because I was still only at about 1 cm dilated, I was all set to keep my appointment at the hospital that evening to start “ripening,” where they would give me Cytotec to help my cervix ripen and hopefully start the labor process. We went home, double-checked that we’d taken care of everything we needed to for the next few days, and I made myself a nice, big lunch. Then, we packed our hospital bags into the car and headed to the hospital around 3pm. We got there around 3:40 and were in a room shortly after 4. I changed into a gown and got settled into the room. We were in the High-Risk Perinatal Center for the evening, not a Labor & Delivery room, so the room was different than the ones we’d seen on our tour. Then, we met our first nurse, who got me set up with a saline IV lock and the monitors for the baby’s heart rate and my contractions. Around 6 p.m. I got my first dose of Cytotec. Now, I know there’s some controversy around Cytotec, and I don’t want to get into that. Suffice to say, I had a good experience and trust that my doctors chose it for good reasons. I was initially a bit concerned because I had used Cytotec for my missed miscarriage the year before and it had had some unpleasant side effects, but the dose used for ripening was much, much smaller. Rather than 4 pills all at once, I got 1/4 of a pill every 2 hours, so that even after 8 doses and 14 hours, I’d still taken half what I’d taken all at once for the miscarriage. And I had no adverse side effects. Unfortunately, because I had doses every 2 hours, it was difficult to get much sleep. But I was allowed to eat dinner (and breakfast and lunch the next day! ), so I ordered some food, checked out the movies they had, and settled in for the night. After my second dose, the nurse pointed out that I was having some “good contractions” according to the monitors. At this point, I didn’t really feel anything. I did a Hypnobabies Fear-Clearing track and tried to relax, as I was still having a bit of anxiety about pitocin and labor the next day. A little after midnight, and my fourth dose, I had a bit of excitement when the baby’s heart rate dipped during one of those contractions. I had been turned away from the computer screen (laying on my left side, which will become relevant later on), so I didn’t realize I was having a contraction and was completely shocked when three nurses came in to stabilize me. My main night nurse decided she wanted to put me on IV fluids at that point, so she hooked up to my saline lock. After that, I put an episode of Great British Bakeoff on my iPad and then dozed off until my next dose of Cytotec. From about 2-6 a.m., I attempted to sleep in between doses, which was made more difficult by the fact that the baby was really good at running away from the monitors, or just kicking them off my belly, so I was constantly interrupted by the nurse coming to put them back into place and get the signal back. It was particularly frustrating because I could feel the kid moving the entire time, so I knew things were fine. Around 7 a.m., I ordered breakfast and had Dan (who had been sleeping for most of the night on the couch in the room with me) make me a cup of tea. Around 9 I got my last dose of Cytotec, and at 11 a.m., the doctor checked me and declared that I was at 2-3 cm dilated and ready to move to L&D for pitocin. At this point, I was sort of feeling the contractions, though they definitely felt more like “pressure waves,” as the Hypnobabies language suggested. The doctor said that I could get off the monitors until I was moved, so we took the opportunity to walk up and down the hallway a little. I also ordered some lunch, which came 15 minutes before we moved to the L&D room. Not knowing how soon they would want to start pitocin, I opted to scarf my cheeseburger and mashed potatoes before moving down the hall to the L&D room. The L&D room was huge compared to the perinatal room. I joked that it looked like a yoga studio. I was a little disappointed that being induced with pitocin meant that I had to be tied to monitors and I could take advantage of all that room. The nurse tried to get me a wireless monitor, but the one available was already in use. While we were waiting in the room, I did my “Your Birthing Time Begins” track. At 1:30 p.m., they started pitocin, starting at 2 units and increasing it every so often. I did another fear-clearing session after starting pitocin. I felt the pressure waves becoming more intense, increasing particularly after they increased the pitocin (although I didn’t alway notice when they increased me). I listened to my Birthing Day Affirmations and let the doula know that she should probably come to the hospital. Around 3, I felt a little trickle and assumed I peed a little, but at 4-ish, I went to the toilet and felt a gush, which had some blood in it. When I mentioned the previous trickle, the doctor checked the pad on my bed and said it looked like my water had broken. The doula arrived, the doctor came in to check on me, and my water broke at the same time, so it felt a bit hectic for a minute. My pitocin was around 10 at that point, so I had already talked to Dan about probably being ready for an epidural soon. When Jenny, our doula, got there, we discussed the epidural and when the doctor checked me and said I’d progressed to 4 cm, I decided it would be good to get the epidural now so I could get some rest, rather than waiting until I was exhausted. Of course, the whole time, Dan was helping me with my Hypnobabies cues, and when Jenny got there, she helped, too. I’m pretty sure Dan picked up on some of the specific ways she helped me stay relaxed through contractions, which were actually starting to feel pretty painful at this point. A little less than an hour later, the anesthesiologist came in and did the epidural and I had to lie flat for 20-30 minutes to let it start working. I think I actually got a little sleep at this point. Then, I moved to my side with my leg up on a peanut ball to try to encourage the baby to descend (I was dilating and softening, but he was still at -2 station). After a bit, I noticed I was starting to feel pain from each contraction localized in my left hip. We thought maybe it was the epidural pooling because I was on my right side, so I switched sides. Well, at this point, we started realizing that laying on my left side was something the baby didn’t like because he had a few heart rate decelerations. I also noticed that the pain in my hip was getting worse, not better, and starting to spread across my body. I mentioned that I thought my epidural might not be working, and the nurses tried pushing the button to give me a little surge of medicine. That didn’t help. At this point, my contractions are coming back in full force. They’d also been increasing the pitocin, so by the time it became clear my epidural was failing after only a couple hours, I was at the maximum dose. They called in an anesthesiologist, who tried some of the same things as the nurses in terms of giving me a boost of medicine, including injecting a dose directly into the epidural line. This sent an icy wave down the right side of my body, but I felt no relief on the left. I was probably pretty close to the pitocin equivalent of transition because I was shaking and crying. This couple of hours was the worst of the entire experience, and I was honestly very close to begging them to just take the baby out however they could, but Dan kept me calm and helped me through the experience. Eventually, the anesthesiologist came in with an ice cube and tested my feeling. When I jumped at the coldness when he put the ice cube on my right hip, he said it was time to redo the epidural, at about 9:30 p.m. I didn’t think I was going to be able to sit up and hold the position necessary for the epidural a second time, while going through these worse contractions, but the combination of Dan being awesome and the anesthesiologist being extremely quick made it happen. And it was ah-maaaaa-zing. It did take a few minutes to really take effect, but I swear I instantly felt the edge taken off. And then I was able to rest. Unfortunately, between 2 and 3 a.m., the doctor checked me again, and apparently I had been stalled at 7-8 cm with the baby still at -2 station for several hours. Also, the baby kept having increasing distress when I lay on my left side to try to encourage the baby to drop. Apparently, this was particularly scary for Dan because he just saw the monitors and, like the nurses, worried something was seriously wrong. I didn’t realize how worried everyone was because 1.) drugs and 2.) I could feel the baby moving the whole time so I just assumed he was fine. At about 3 in the morning on Friday, the doctor sat down to discuss “options,” given that the baby wasn’t descending. I asked her “Just to be clear, is this a c-section conversation?” and she said yes. We discussed it with Dan and Jenny and Jenny suggested that, while there were exercises that she thought could help the baby engage better (he was slightly off-kilter and his skull was crammed up against a bone in my pelvis), they all involved lying on my side, which seemed to be a no-go for the baby. So I decided that it would be best to proceed with the c-section now, rather than waiting until it was actually an emergency. I had to wait for an operating room for a little over an hour, but by 4:20 a.m., I was in the operating room. Dan joined me soon after and helped me stay calm. I didn’t realize how much the anesthesia would make my arms shake, and having Dan there helped me feel calmer, even though he says he didn’t notice me shaking any less. The c-section experience was a little surreal. I definitely felt pressure and pulling, but nothing even remotely resembling pain. 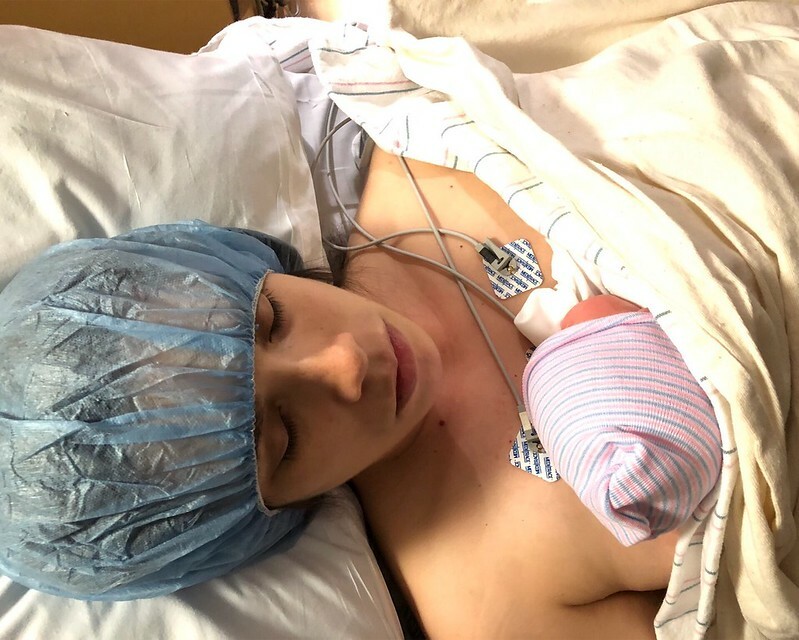 It probably helped that I have a lot of trust in my OB practice, so I was confident this was the right decision and that they would take care of me, so I didn’t have any regrets or disappointment about having a c-section. At 4:43 a.m., on Friday, December 28th, Elliot was born, via c-section. He came out crying and peeing on everything. And when they lowered the opaque part of the drape to show him to me, I cried like I had when I first saw him on the ultrasound screen. My little boy was here and was doing great. He definitely got delayed cord clamping because there was a minute of laughing while he peed on the OB, the pediatrician, and a couple nurses. And then they called Dan over to cut the cord and hold him. I was exhausted and actually dozed off for a minute before jerking awake at some point. A little after 5 a.m., I was wheeled back to the L&D room to recover and do skin-to-skin with Elliot. We got about 20 minutes of skin-to-skin and nursing before I allowed the nurse to take him for a few tests, and then he was brought back for at least an hour. I was so exhausted, but the nurse offered to sit with me and watch us so that I could keep him on my chest without worrying that he would roll off if I fell asleep. After a couple hours in recovery, we were taken up to the maternity room, where our postpartum journey began for real. Well, this has already become quite long, so I’m going to stop there. I’ll talk about my c-section recovery, and how Dan was so key in helping me through the birth in later posts. But for now, that’s the story of my exciting, 30+-hour induction and c-section and the arrival of baby Elliot. Ahhh I’ve been waiting for baby Elliot’s arrival for ages! I legit cried while reading, way to roll with the punches (and make a really beautiful baby TTTT)! Thanks so much! It took a while to write this because I actually kept detailed notes during most of my induction and couldn’t figure out where to trim.